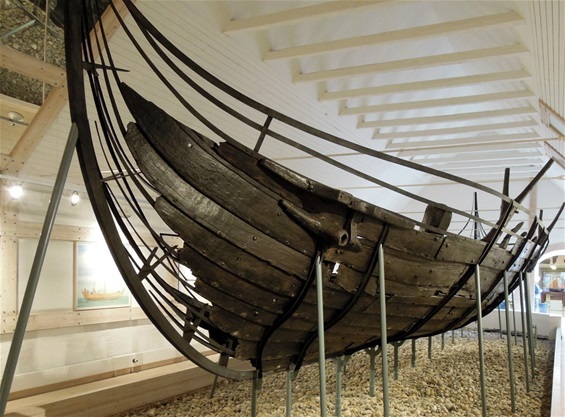 I had myself a little trip to the Bangsbo museum in Denmark to see the Viking ship. 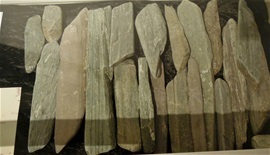 It was also displayed a nice selection of sharpening stones that was imported from Norway to Denmark. The selection contains stones that are from the year 600 until after medieval times. The stones were exported all over Europe. They come from the Vest of Norway and sharpening stones was distributed from many more places here to Europe. In the history lesson we know that the stones were part of the very important trading that helped establish trade centers and areas. The stones were very important for all kinds of sharpening. It was used different stone material that was found naturally or in a quarry. It was the same as today with different stones from part of this country with the structure in them. It was used fine to coarse stones for the process. Nobody really knows how far the Scandi knife goes back. Some say before the Viking times. The heritage gives some clues about the stick tang, blade and handle design found from archeology. There is a very long tradition for using laminated blades with a stick tang construction. For us knife people that are interested in the utility-use and traditions know that basically the knife was a tool in the everyday life. It is a very long tradition for using wood handles with the hidden stick tang because this is the best and most comfortable design. It is the best in cold weather situations as well. From what I have learned over the years it was also used the cold hammering of the edge. The age of the Scandi edge we do not know fully. The contact a knife handle makes in the hand is like an unknown energy emotion that tells us about the comfort, ergonomics and for what use intended. The edge must be very sharp and durable. It must be easy to sharpen and bite wood. The over-all feeling of the complete knife and design is very important for the comfort and cutting performance. All my experience and knowledge tells me that they are cutters in excellence. What you can be very sure about is that the “tollekniv” is very old and it was used before and used today because it works very well. Today we live in a world with pure luxury sharpening devices on the market. Even so many cannot sharpen knives. It got nothing to do with intelligence, it is all about training and what or where people are born and live. I am also very sure that people in ancient times had several ways of sharpening their tools and did require different grits and shapes of the stones. I am not going into the aspects of steel used before. What we know is that over 1000 years ago people had high quality tools. They had a good selection of cutting tools and by looking on the carvings found from this time it are clear that they had precision high quality tools. For precision carving and artwork they required not only precision cutting tools with good steel and edges, it was also required sharpening devices and maintenance tools for them. I learned some historic facts from people that reconstruct artwork and craftsmanship from this time that they too are convinced that the tools used back then must have been surprisingly well. 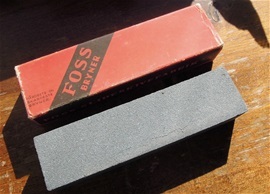 Here is a sharpening stone from the Foss slipeskivefabrikk AS that is a company that started in 1898. It was started by two brothers that educated themselves in the USA. One of them started a company called Pacific Emery Wheel Company that was sold after starting in Norway. 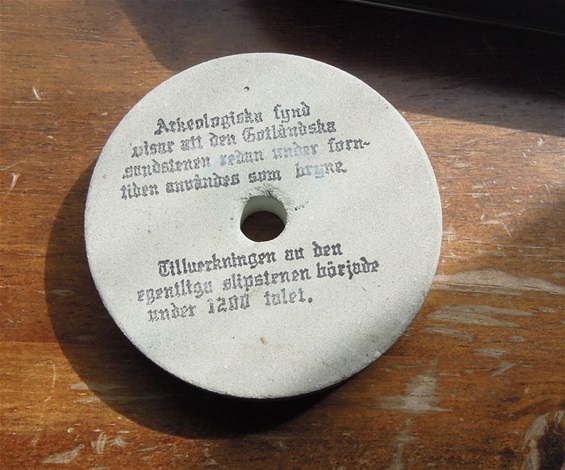 Information from (industrimuseum.no) Today it is called Pacific Grinding Wheel in Marysville. It seems it is still around. The Foss factory ended in 1992. The sharpening stone is coarse but not very coarse. It would become smoother in time. I am not sure I will use it because it is never used and in original box. There is interesting information and history regarding the Foss factory with sabotage by the Pelle group during WW2. "Pacific Grinding Wheel Company was established in Everett, Washington (U.S.A.) in 1898 as Pacific Emery Wheel Company by Mr. Anton Foss, Mr. Martin Johnson and Mr. P. Lee. Mr. Foss, who had the major interest, came from Norway. Seeing an opportunity, he established the business to supply grinding wheels to the lumbering industry for sharpening saws, planer knives, etc. The processes used for bonding the grinding wheels were the "Shellac" and "Silicate" processes"
I am very interested in information regarding this stone and what process used. 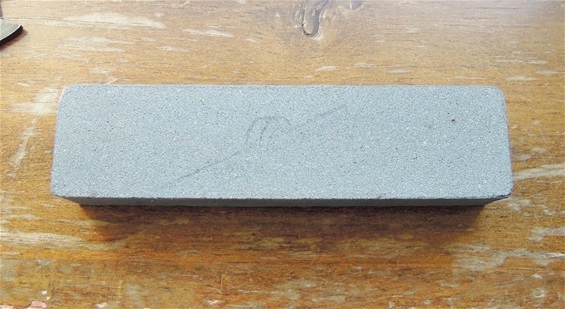 The sandstone from Gotland Sweden was used for sharpening. 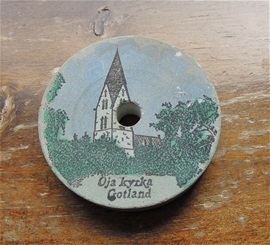 This stone with the Öja Church I am currently researching to find the date. It is related to the original stone from the year 1200 according to information on the back of this sandstone. Sword marks in stone and long lines can be found that show the grooves. These are from the mentioned swords and the sharpening of weapons. 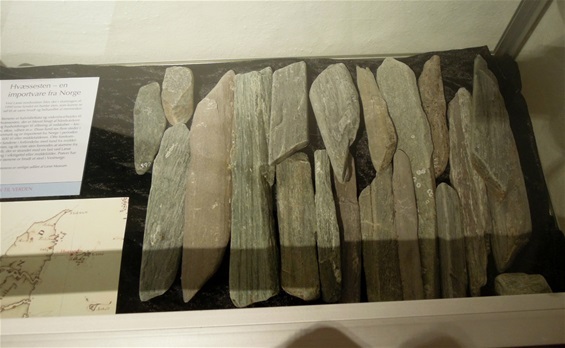 During the Viking age it was distributed natural stones from several parts of Norway like already mentioned. The stone with the church seem to be sandstone and how it is related to the original stones that started in the 1200s is from the stone and other information. The development of the sharpening wheel is a special development and what I am interested in learning about. For sure this stone with the church is more modern and so far I have placed it around 1950. Please let me know if you have information. It is also so that the use of wheels for grinding and sharpening got a very big time frame from place to place. I am very careful being bombastic on that history.